Melt Organic Buttery Spread just keeps evolving. The Original was pretty tasty to start, but then all three flavors went dairy-free. Now they are swapping out the honey with a bee-free, vegan alternative. And they have a new Probiotic variety! 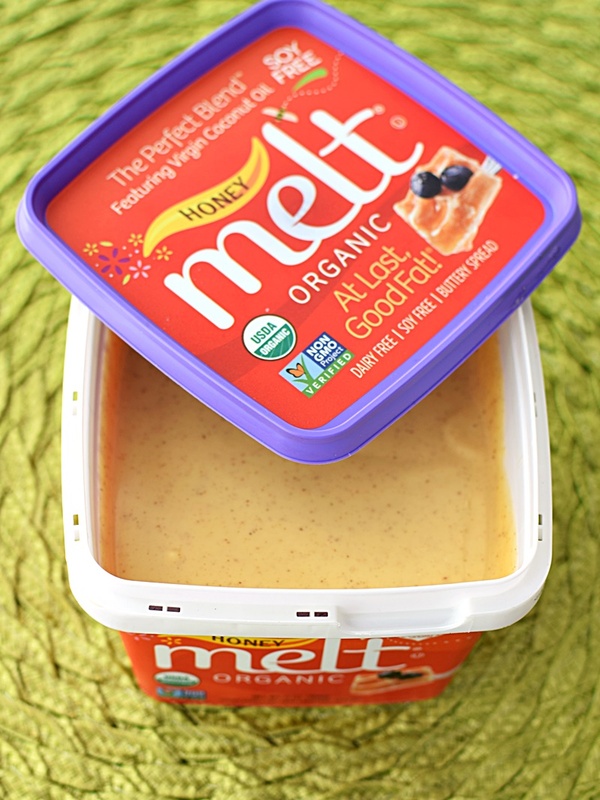 All of the Melt Organic Buttery Spreads boast a good Omega 6 to Omega 3 ratio (2:1) with their fair-trade, organic blend of virgin coconut, palm fruit, canola, hi-oleic sunflower, and flaxseed oils (in that order). They’re also soy-free and free of pea protein (no added proteins at all!) for my peanut-free friends with pea concerns. This is your standard, multi-purpose “butter” – and oh my goodness, is it every melt-in-your-mouth creamy! By far the smoothest on the market. 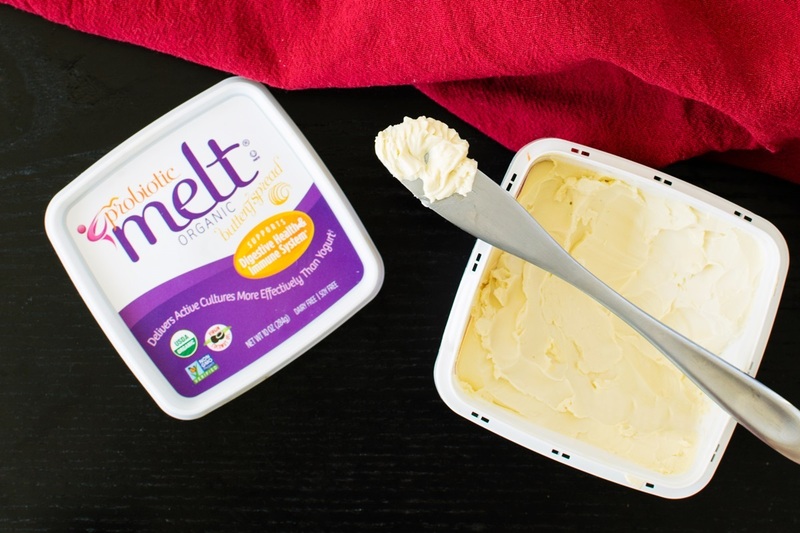 Melt Organic Buttery Spread begs to be dolloped over pancakes, slathered on toast, and drizzled atop potatoes. In fact, one of my first tests with it was making these Petite Pommes Anna (a.k.a. Buttery Scalloped Potato Stacks). In terms of taste, the Original Melt Organic Buttery Spread is perfectly luxurious, mellow and, well, buttery. It’s flavorful yet less salty than the competitor. It’s perfect for using in place of salted or unsalted butter in recipes. So how does it hold up in recipes? Aside from the potatoes, I’ve tested it in baked donuts, fudge tarts, baked and no bake pie crusts, icing and whipped “cream” recipes with marvelous success. 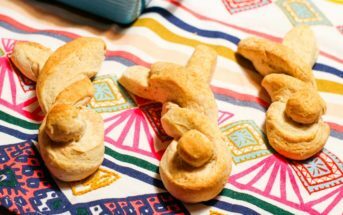 Despite it’s very soft consistency that begs to melt in our toasty abode, It worked exactly like butter in baking and toppings – I was thrilled! They are changing the sweetener to vegan apple “honey,” and promise that the taste is every bit as delicious. 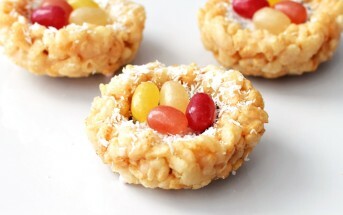 That touch of sweetness adds just 1 gram of sugar per tablespoon but imparts a wonderful warmth and indulgence. It takes waffles, muffins and toast to a new level. The addition of cinnamon gives it a rich, sweet and savory appeal that is versatile for recipes yet delicious as a straight up topping. Each buttery pat is infused with organic inulin for prebiotics and Bacillus coagulans GBI-30 6086 for probiotics. This is a patented probiotic strain that they say “delivers active cultures more effectively than yogurt.” I’ve read that it is also heat stable. But I would personally still stick to low heat applications with this spread. 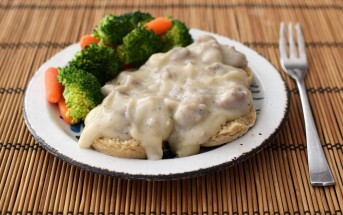 It’s a very firm spread, but it softens readily at room temperature or atop warm food. The flavor is a touch saltier than the Original, despite having the same amount of sodium per serving. And it does have a very slight “fermented” vibe that I think adds some depth to the flavor. I enjoyed it on traditional toast, rice, and potato mediums, and I think it is a great way to sneak in more priobiotics! Price: I’ve seen Melt Organic Buttery Spread for $4.99 per 13-ounce tub. The new Probiotic variety is in a 10-ounce tub. 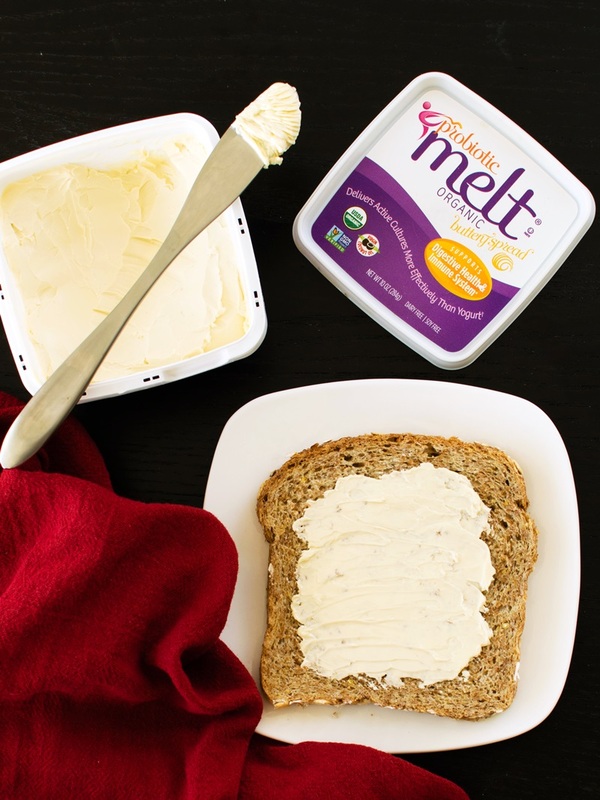 Availability: Melt Organic Buttery Spread is sold at conventional and natural food grocers across the United States. You can also order it direct from their website below. 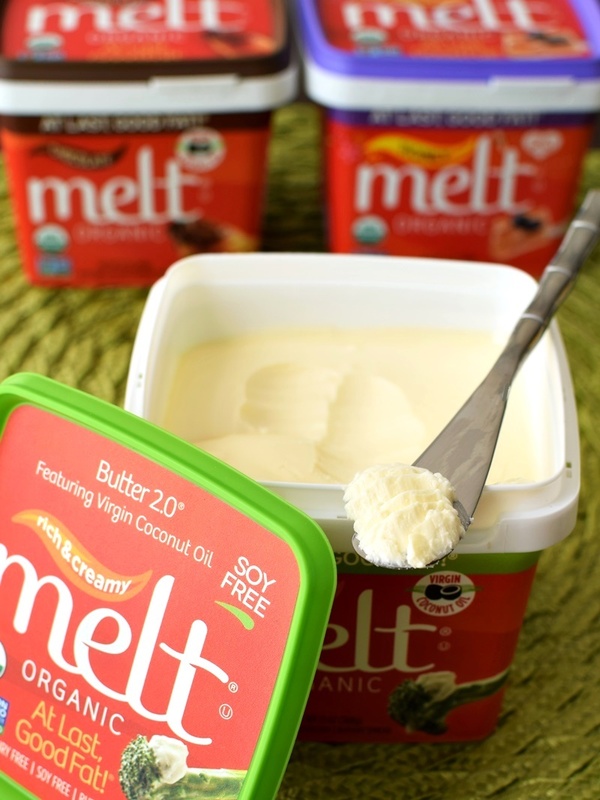 Certifications: Melt Organic Buttery Spread is Certified Organic, Non-GMO Verified, Rainforest Alliance Certified, and Certified Fair for Life Fair Trade. Dietary Notes: By ingredients, this Melt Organic Buttery Spread is dairy-free / non-dairy, egg-free, gluten-free, grain-free, nut-free, peanut-free, soy-free, vegan / plant-based and vegetarian. Nonetheless, always read the ingredient statement prior to consumption, and check with the company on their manufacturing processes for all varieties if potential allergen cross-contamination is an issue for you. Processes and labeling are subject to change at any time for any company / product. 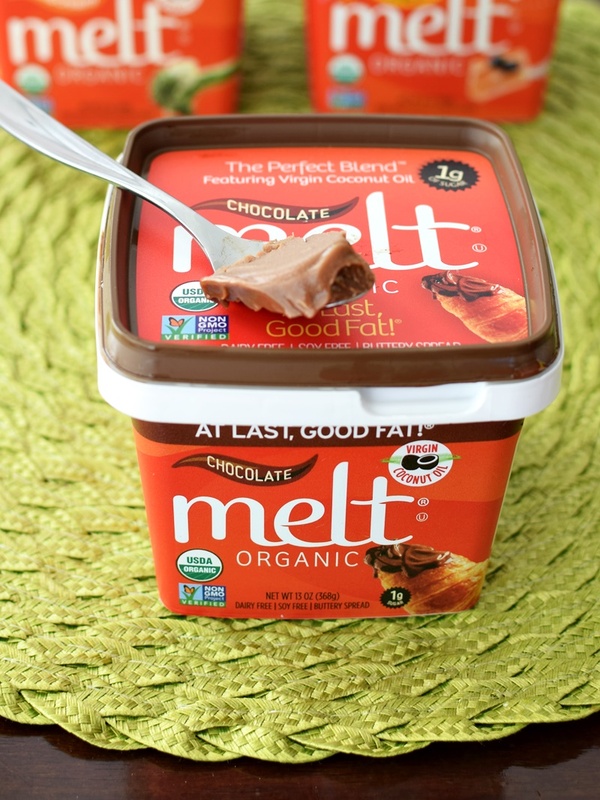 For More Product Information: Visit the Melt Organic website at www.meltorganic.com. I love Melt Organic spread. AS a life long butter addict, now that my body rejects all dairy I find Melt spread the closest in taste and texture and versitility over all other vegan “butter” substitutes I have tried. IT is also available in mainstream grocery stores and frequently on sale. It is great in biscuits, on pancakes, on vegan yeast rolls, in cornbread, etc. 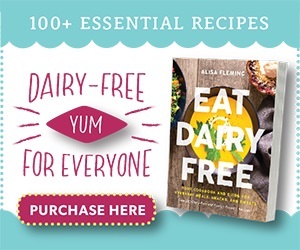 The Melt Sticks work best in dairy-free and vegan cakes and for those that avoid canola. The Melt Probiotic spread is not my favorite but I am not fond of products with too much inulin. This is hands down the worst tasting spread. Hi Simon, I can honestly say that I don’t notice coconut flavor in this. But coconut oil is still one of the main three oils used in their oil blend, so it’s possible that you could taste it? Is it safe to freeze Melt spread? I haven’t frozen it myself, but in theory it should freeze well. I absolutely love this stuff, dairy allergic for 40years, found nothing as good; but why do you put it in a tub that has an impossible-to-open lid? The gap created by the removed safety pull tab is in the wrong place, so one must pry the lid off with a thin knife blade from a corner instead, or just leave it uncovered. Sign me: broken fingernails. OMG, I just discovered this at my local Kroger’s outlet Food for Less last Friday, when I was shopping for my regular Smart Balance, quite by accident, literally almost stumbled upon it. Had never seen it, read the label sounded good & decided to try it. Love it and decided to dig for more info & reviews. What a surprise to find that apparently this product has been around since ’14! and I just found it in April 2018! Food desert, in one of the posh Chicago suburbs! Hope it sells well so that I can continue to get it. Yes, and they have new varieties coming out this year! I’ll be updating our reviews with those soon. Glad you found it! My Giant is no longer stocking Melt. I can’t find this product anywhere. What happened? I’m not sure! They’re availability seems to go in and out where I’m at too – but I just spotted some yesterday. You can check the store locator – http://www.meltorganic.com/where-to-buy/store-locator/ – or contact them directly. They might be able to shed some light. Do you have an understanding of what “natural flavors” are? Whenever I ask a company they say they can’t give that information b/c it a “proprietary blend”…Thanks! 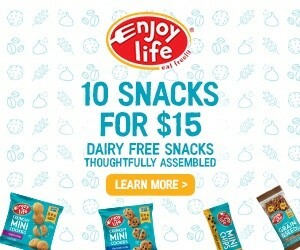 Hi Meghan, the natural flavors could be derived from almost anything, but if they contained any of the top 8 allergens (dairy, eggs, wheat, soy, peanuts, tree nuts, fish, and shellfish) then they would be required to state that it contains that allergen on the ingredient statement. If your concerns go beyond these top allergens, then you can send the company what foods you are avoiding or allergic to, and they should be able to tell you if the natural flavors or other ingredients will be a concern. Tried it. If you like the taste of butter, FORGET IT! Tastes like sweet coconut. Threw its out after one taste. Planning a taste test on all available butter substitutes. This awful stuff has piqued my interest. Did not care for it, and pondered returning it to the store. 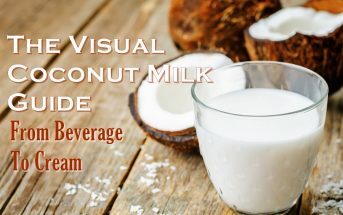 It tastes strongly of coconut! Not what I want to put on toast or vegetables. Will not buy again. HI Alisa, do you have any idea where I can purchase this in Toronto, Canada? Hello there, I was recently introduced to Melt and really like the taste and what’s in it. I have a concern about preservatives. What makes it stay good for over a year? What do such preservatives do to my body? It’s organic and RSPO certified – http://www.meltorganic.com/our-products/sustainability/ – If sourced responsibly, palm oil is more sustainable than most other oil options. But it’s important to look for things like organic and the RSPO certification to know that it isn’t contributing to rainforest depletion and destruction of habitats. I was no palm before I became a vegan. I am not sure about this one. Palm is palm. Someone destroyed the forest. Weather they did it or not. Have you tried the potato stacks with sweet potatoes, I haven’t tried the regular ones yet, but I would like to know if you have any with sweet potatoes. I haven’t Cindy. Sweet potatoes cook up much softer and quicker than regular potatoes, so I would keep an eye on the cooking time. Can I use this instead of butter in frosting? Yes! I have – it was great. Just a touch softer, but still works well and the flavor is nice. OK thanks for the information, this is my first time using this butter, and hoping it’s as good as I hope it is. Do you happen to know if Melt uses humane non-deforestation palm fruit? I looked at the fair trade certification and that seems to only pertain to ethical treatment of humans, I didn’t see any mention of animal habitat protections. Recently it was noted that Earth Balance purchases palm fruit from unethical non-humane sources. I appreciate your feedback. Hi Dina, you would have to verify this with them directly. I have spoken with the founder, and she is very environmentally aware, so I would imagine so, but I couldn’t tell you! Great news, Rich & Creamy MELT Organic is 100% Dairy Free and vegan. We removed ghee from the formulation in July of 2014 and all three of our spreads are now dairy free.